Gold makes everything look just a little bit fancier, don’t you think? 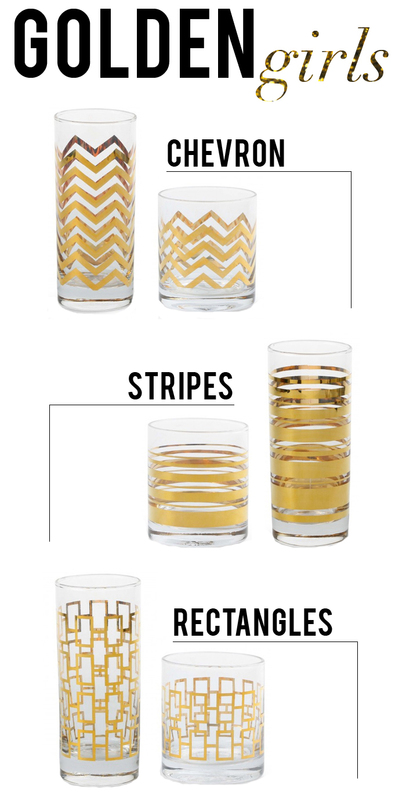 These gorgeous glasses would make an excellent addition to any kitchen – especially with the gold utensil trend happening right now. I love the chevron is super fun, the rectangles a little retro, and the stripes are classic with a twist. Which is your favorite? I can’t decide. Did I mention they run for $48-$52 for a set of four? Yes, please. These are SO cute! I think I like stripes the best, followed by chevron! They’re all adorable, though! My favorites are the stripes and chevron prints! Thanks for sharing! I love them all. Chevron’s my fave! It’s a toss up between the stripes and rectangles! Chevron for the win in my book! All lovely though.